A few weeks ago (a few more than a few) I made the drive to Green Bay, Wisconsin, to collaborate on a few projects with April Wilkerson of Wilkerdos.com and Nick Ferry of Nick Ferry.com. We ended up being way more productive than I expected (A crazy amount of laughs and good times) and this is one of the projects we knocked out while up there. 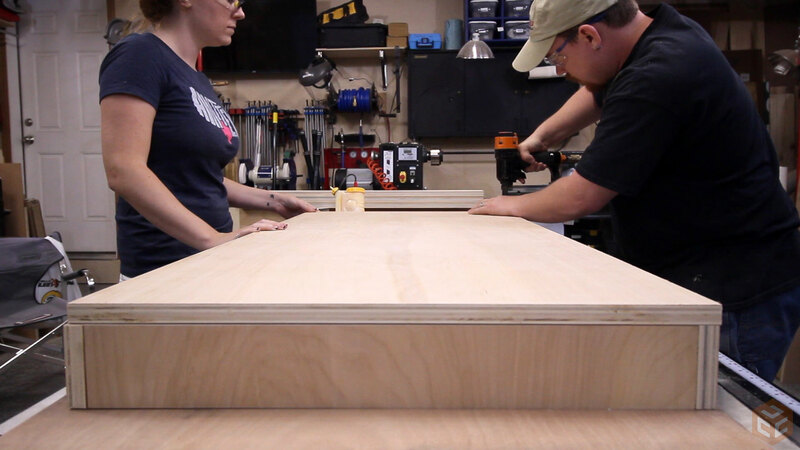 It will be used as an assembly/outfeed table. We had two requirements when designing this shop table. 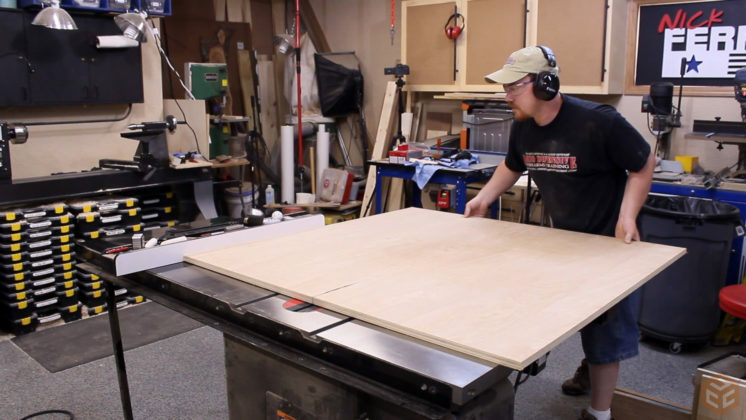 First to maximize the size of the table using ONLY one sheet of plywood. And also to utilize a simple construction method that is also strong enough to use for multiple items in the shop. The design we came up with was pretty straight forward and nothing complicated at all. 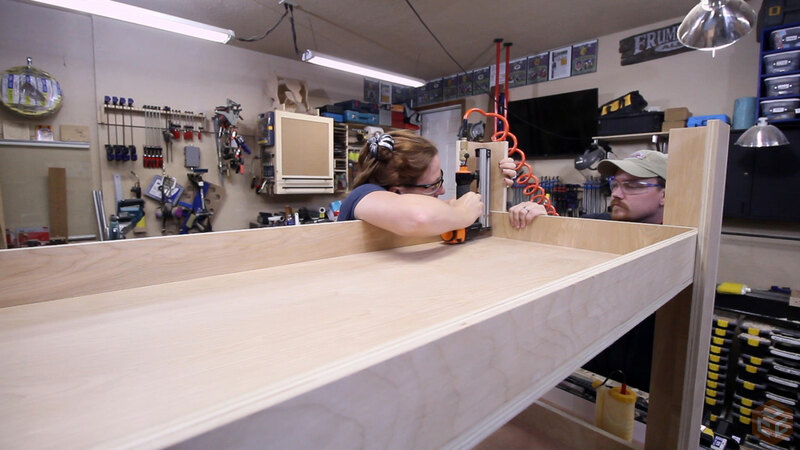 It’s about 2′ wide, 4′ long, and the height is slightly less than the height of Nick’s table saw. It has a lower shelf and a slightly larger top working surface. The legs are wide for a lot of glue surface area which results in a sturdy lap joint that resists racking. The design also didn’t have many overlapping dimensions with the ends of the plywood so we really didn’t have to take into consideration the slightly less than 3/4” thick plywood. This allowed us to follow the cultist exactly and cut every part before we started assembly. If you want a free sketchup file and cutlist diagram just click here to download it. We’re making an assembly table because…well, we don’t have a table to work on. 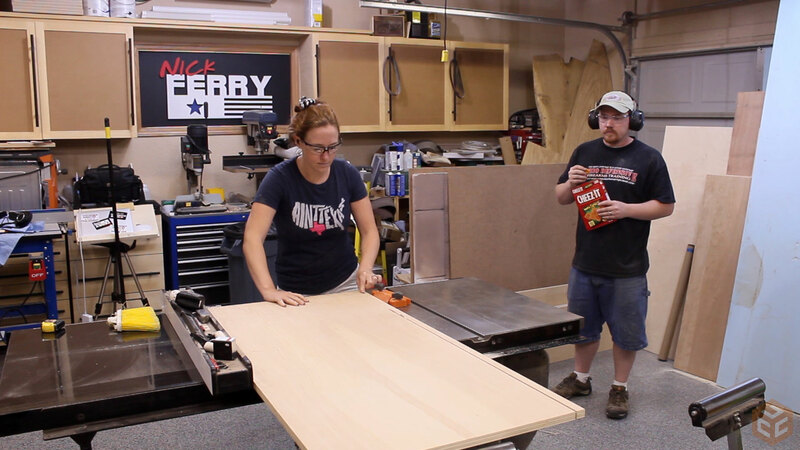 So instead of cutting this on the floor or trying to wrestle a full sheet of plywood through the table saw we put a couple foam panels on the table saw to act as a working surface. 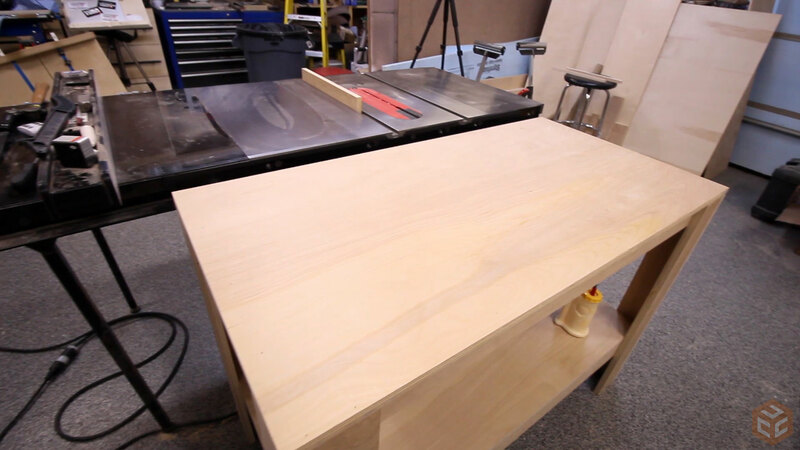 Making the first cut on a full sheet of plywood with a circular saw results in two much more manageable sized pieces that can be cut more accurately at the table saw. To do this we used a circular saw track. With the first cut made the rest of the parts could be cut out according to the layout diagram. Nick had a couple roller stands that we used for outfeed support. I’m not a fan of them at all as there is a little extra room for trouble when using them compared to an outfeed table. Luckily everything went as planned though. This was a team project with myself and April so I made sure to stay busy while she was working. The majority of the cuts were made using the table saw and rip fence alone but we did have to crosscut a few pieces. 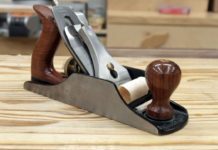 When crosscutting on the table saw if your piece is significantly longer left to right than it is front to back using just the table saw fence might be a little dangerous as you might not have enough surface area referencing off of the fence causing the piece to bind into the blade. 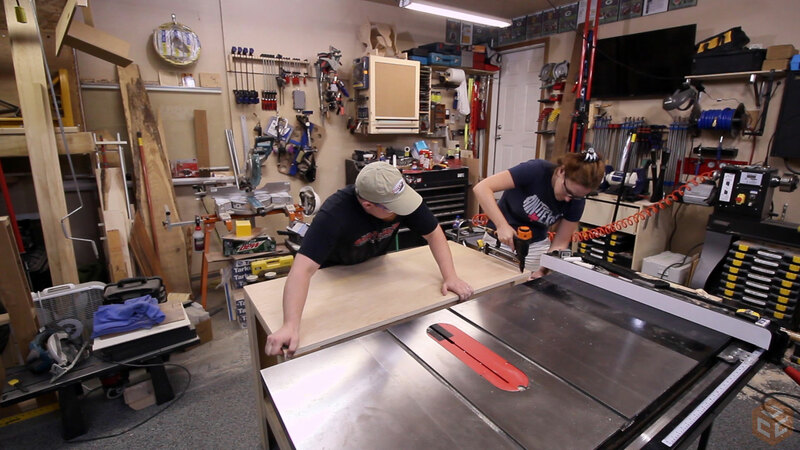 So for those cuts we used Nick’s table saw crosscut sled. 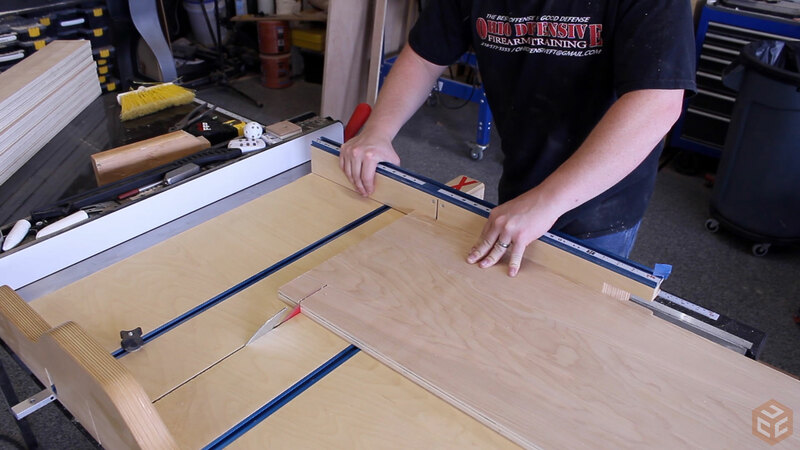 For assembly, Glue and brad nails are used in every joint on this table starting with the identical top and bottom frames. For one of the frames the lower shelf can already be installed. Again, Glue and brad nails. Next up is the legs. Just make sure the best side is visible and assemble the four L shapes. Once again, Glue and brad nails. With all of the frame and leg sub assemblies complete the final assembly can start. As I said earlier the real strength of this table comes from the wide lap joints so you really want to make sure you maximize the glue surface area here. 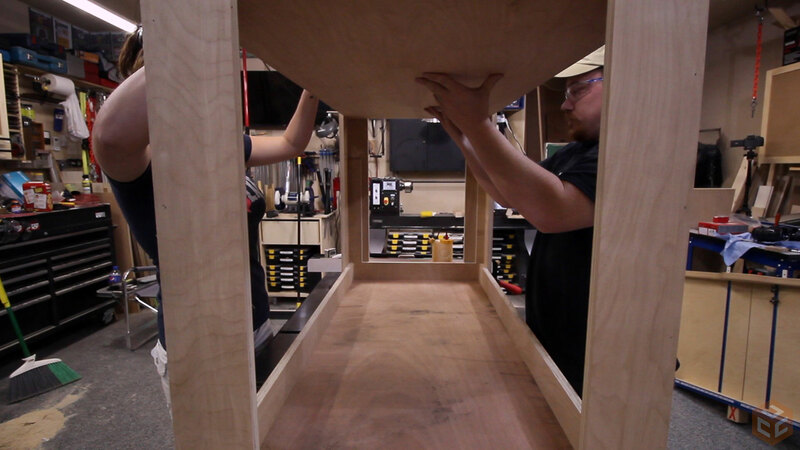 We’re building this upside down so the top of the legs can reference flush with the top of the top frame. Again, glue and brad nails. Using scrap from the full sheet of plywood we cut four spacer blocks to locate the height of the lower shelf. With glue applied to both the legs and the lower frame we slid it in from above. And to secure the lower shelf in place we used…more brad nails. Finally the table can be flipped back over, set on the floor, and the final top surface can be attached with…you guessed it, glue and brad nails. So the main idea for this table was to have some type of working surface or working table to use for the rest of the collaboration. But it doesn’t have to be used as an assembly or outfeed table like we have it here. 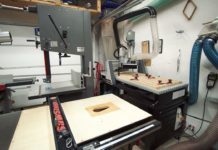 You can use the same design for a drill press table or anything else really. Make multiples and have a modular setup. 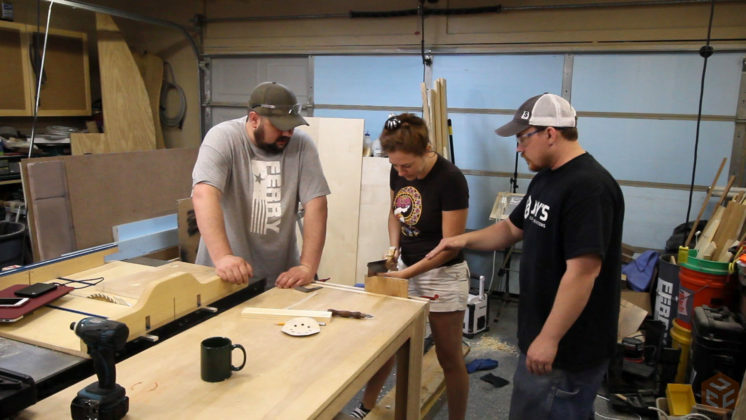 Speaking of colaboration this table does reside in Nick’s shop and he has since made some changes to it as well as a video covering those changes. Click here to go to that article. 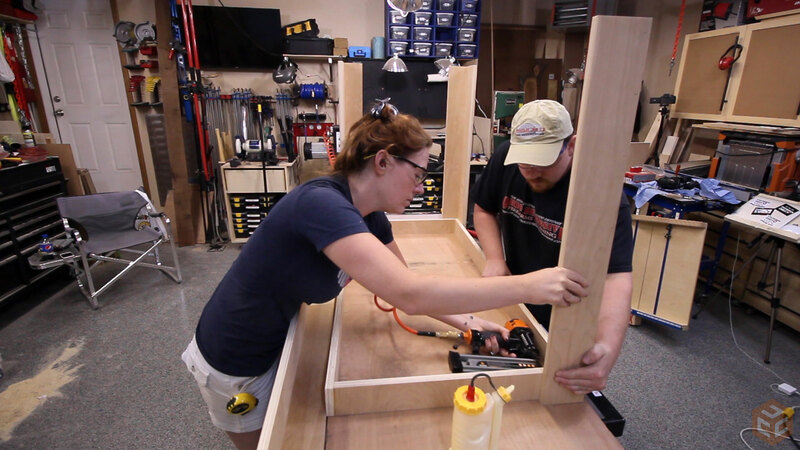 Also April ended up making a folding outfeed table for her table saw. Click here to see that. And if you aren’t already, be sure to subscribe to both of them (Nick’s channel….April’s channel). Not only because they make awesome videos but also because they have some videos coming out from our collaboration trip and you definitely don’t want to miss those. 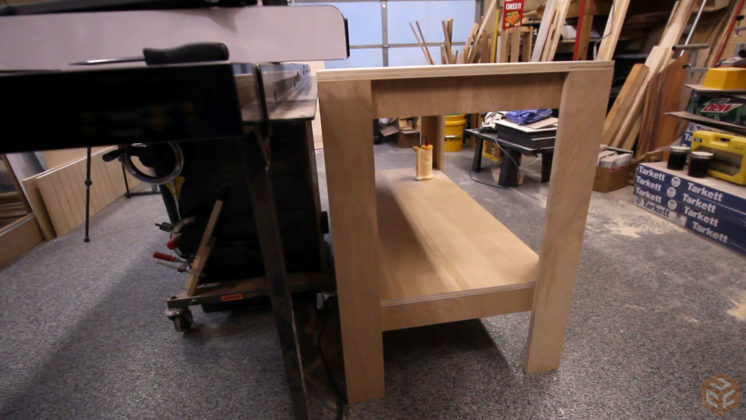 If you’re interested in a free cutlist and sketchup file for this table check out the build article for this video. Thanks for watching and take care. What a great idea. Looks really quick and relatively inexpensive. What is your opinion for using staples instead of nails for a project like this. I have found they hold better in most cases. Always enjoy the projects with April and Nick. I bet they are a hoot to work with. The staples or nails are mainly to hold everything in place while the glue dries. Staples will work just as well if not slightly better. Incorrect. Not sure what problem you are experiencing but the file is fine and is downloading fine on all of my tests. One file is a picture file and the other is a sketchup file, you can only see it if you have sketchup. 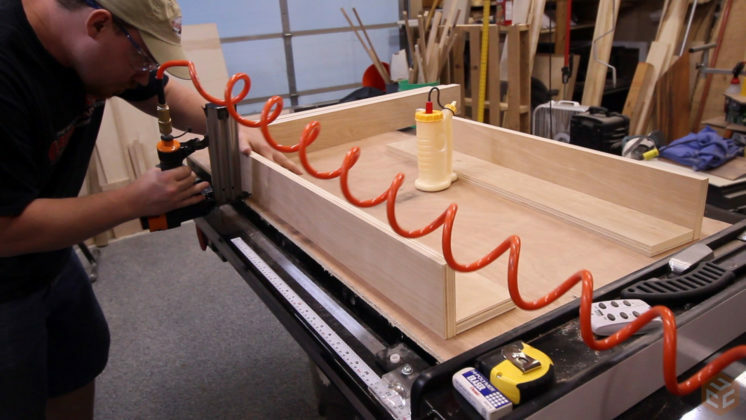 How much shorter than the tablesaw height would you recommend building this? Looks like 1/2″ or so from the video. Looks very useful; going to build one for my shop today. It depends. This was lower as Nick wanted to add leveling feet. I’d recommend about 1/8 lower than the top if you are going to cut miter slots. 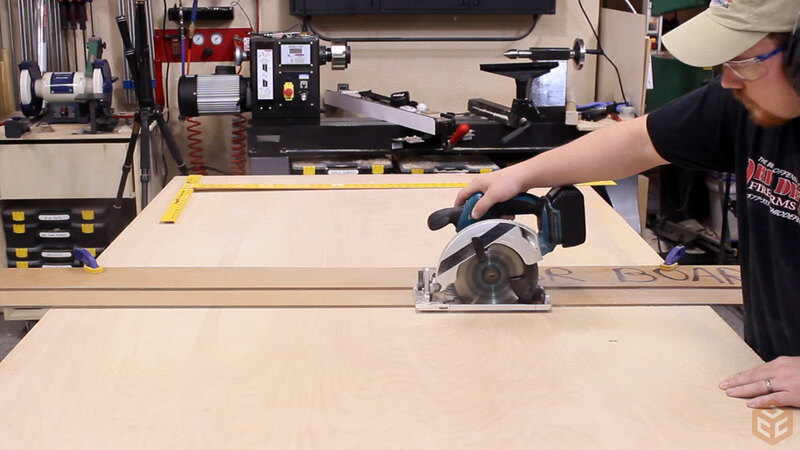 If you aren’t going to cut miter slots make it about 1/2″ below so that the sled runners can go on top of the outfeed. Either route will work. 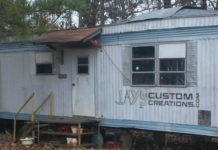 This is a great starter project that anyone can build. It also has a lot of other uses like you said, than just an outfeed table. Great video and article. I REALLY appreciate your introducing me to the lovely and talented Miss Wilkerson (it’s OK, I’m an harmless old man). Any young lady who wears such an excellent t-shirt has won my heart. Thanks for some more brain candy while i’m away from home at work, we appreciate it. My table was built basically along these lines but I made one side of the legs narrower by the dimension of the plywood. This results in the legs being the same width when viewed and just looks nicer to me. 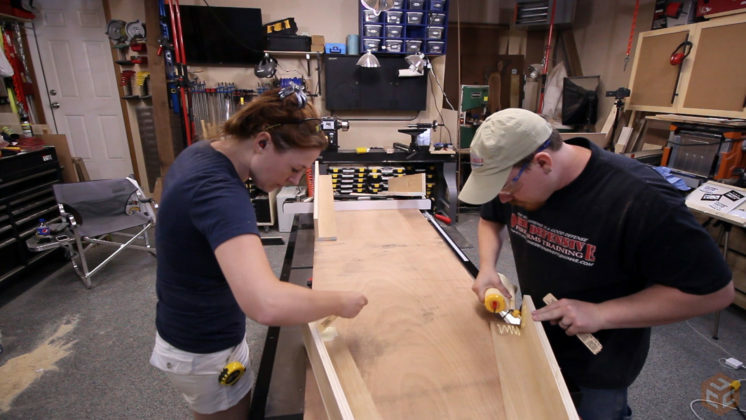 It neither adds nor detracts any functionality to the outfeed/assembly table. I still have not added any organized storage beneath but it is definitely being used. Perhaps someday down the road I will build something along the lines of the one that Nick built. Did you guys end up installing a pipe clamp vise like your assembly table? I was wondering if you had a cut list other than Sketchup? something old like a PDF? I have looked at trying Sketchup, but the old mind is….old! I was wondering if you had the cut list on something other than Sketchup? Like the old PDF? I looked at trying to use Sketchup but the old mind is… old! Very nice job and well done. I like it. 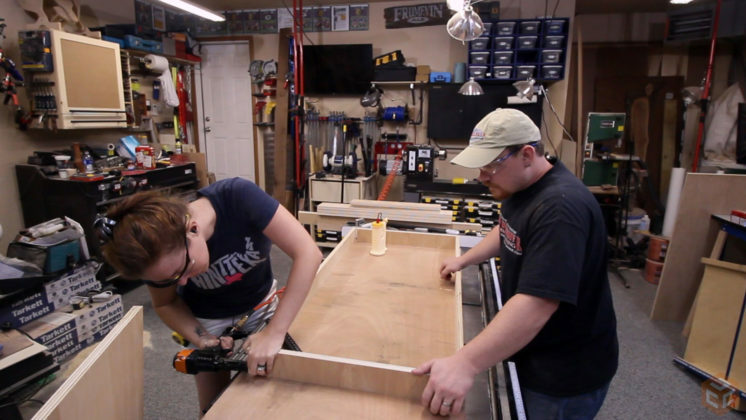 That shop table can be very as useful as easy to be built. As for the four spacer blocks, I think that besides being important to locate the height of the lower shelf, they also help supporting the upper shelf better. For that reason, I’d have inserted other four spacer blocks to support the lower shelf, too. The table would begin sturdier and sturdier in such a way. What about, Jay? Ciao, Giuliano. Thanks for the plans Jay and April. I keep meaning to build a small assembly table to replace what I currently use which is a piece of plywood on sawhorses. Thanks again for giving me a project for this weekend. Hi Jay, what do you use to generate your cutlist? Or is it manual? What is the thickness of the plywood? I don’t have much area to work with at this time. Would this table allow for a vice to be attached or would a sturdier bench be necessary? Great video and project! I have been needing an assembly table for quite some time. This gave me all the motivation I needed to bang one of these out last weekend. Excited to see your addition of the pipe clamp as I was thinking of adding one to mine as well. Going to wait and learn from you. Greetings from the Gulf Coast. Did you glue the lower shelf? 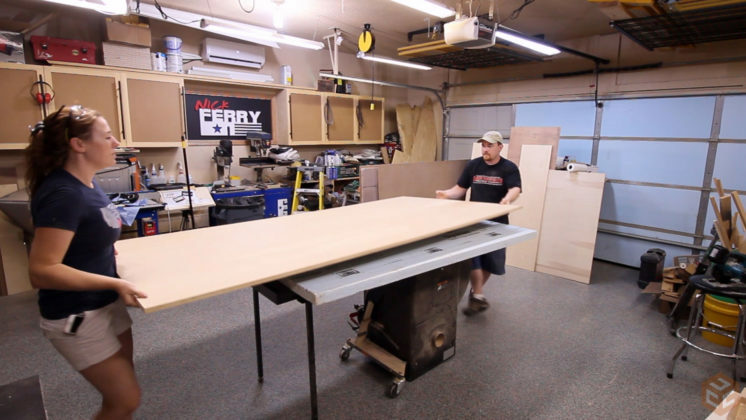 There is an old New Yankee Workshop video where Norm builds a similar table. His was bigger and had fold away casters for moving it. I was planning on that one, now I will probably start with a few of your design. I also see a Paulk- type top with the L-Shaped legs in my future. Yes, the lower shelf is glued.